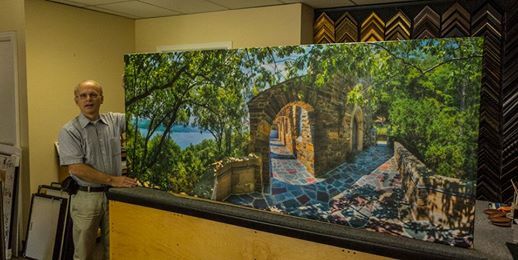 This 36×86-inch canvas is ready to be delivered — destined for a lobby and reception desk at the BEST WESTERN PLUS Vineyard Inn & Suites, 142 Lake Street, Penn Yan, NY. The client selected the summer scene to better fit their décor, I also have it with a nearly identical composition with a fall scene. The photo is of Garrett Chapel on Keuka Lake. Many thanks to Daniel Crozet who was my tour guide and suggested the location. Ideal for a panorama, I wanted to be able to include Keuka Lake for the setting. The high contrast lighting was a bit tricky, but I think I got it all balanced OK showing a beautiful sunny day at the Finger Lakes. This entry was posted in Blog, Sales Success and tagged Finger Lakes, Success. Bookmark the permalink.